The cottage has recently been converted to add to our beautiful holiday home (private) and farmhouse. 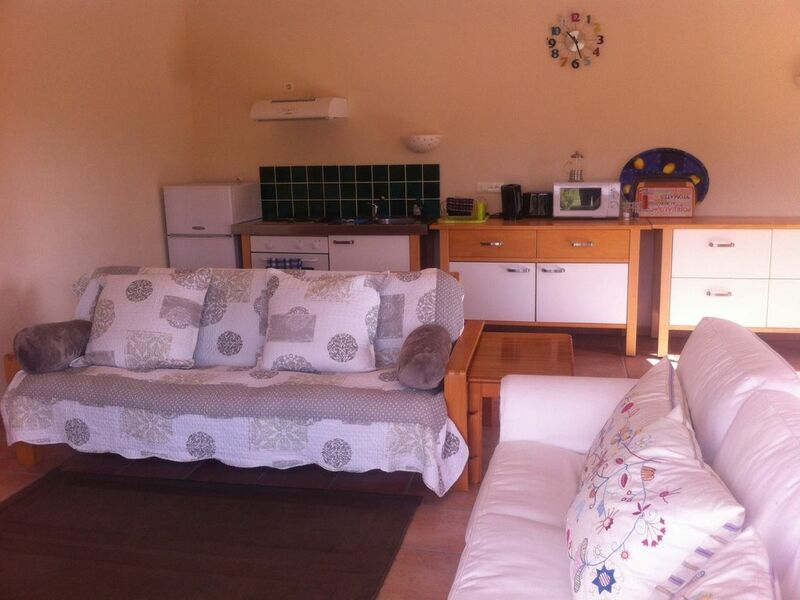 It is cosy, modern and bright with lovely views of the gardens, countryside and mountains beyond. The wood burner (which we provide logs for) for the winter evenings makes it warm and cosy yet being south facing is very sunny and wonderful to open all windows and doors in summer. Very private with own patio and the rest of the gardens , games room , pool / swings etc being only shared with the farmhouse if rented and with us if we can find the time to escape. The cottage has a large integrated living room with French windows overlooking the garden. The kitchen is within this large room. It has two sofas one of which converts into a double bed. There is indoor and outside dining facilities. Off the living space is a double bedroom with a shower ensuite. The cottage was delightful, set in wonderful grounds which are shared by all three properties. It has a very large open-plan living room/kitchen which opens out onto the garden. The large swimming pool is set in a hedged enclosure which serves as a wind-break and sun trap. A very peaceful location, but within easy reach of Carcassonne, Andorra and the South Coast. The nearest town, Mirepoix, is well worth a visit, particularly on market day. We will definitely return to La Prade and can recommend it to anyone who wants to stay in a peaceful location in beautiful surroundings. Tranquility and leisure in beautiful surroundings, clean, comfortable and spacious. An ever changing landscape with activities for all.